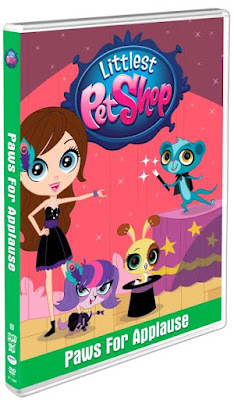 Blythe and her best friends from Mrs. Twombly’s Littlest Pet Shop are back for more off-the-wall pet adventures! Join Zoe the spaniel, Pepper the skunk, Sunil the mongoose, Russell the hedgehog, Penny the panda and Minka the monkey as they plan a visit to Blythe’s fashion camp, prevent the sabotage of an important photo shoot and catch a design thief! All of this and more give us a reason to Paws for Applause! By now you all know we are huge fans of LPS in this house. From the time my oldest was able to play with them, she's always been a fan. So it comes as no surprise that we would all love the television show as well. Now that the latest DVD, Paws For Applause is out, I knew we had to watch it together with my youngest who is just under a year old. She absolutely loves all the bright vivid colors and also loves that the show plays catchy sing-a-long songs to shake her booty to. Paws For Applause comes with five episodes. What I love about this show is how it shows the bond of true friendship and how friends stick together and help one another out no matter what. Now out on DVD you can purchase Paws For Applause in stores or at www.shoutfactory.com. Disclosure: All opinions are my own. I received Paws For Applause on DVD at no cost for the purpose of this review. No other compensation was received.